I had a chance to visit the Hawaiian Airlines Plumeria Lounge in Honolulu before my flight back to Los Angeles. This Priority Pass lounge isn’t much, but worth a stop if you have the time. For whatever reason, I really like the old-school Daniel K. Inouye International Airport. There’s something so “Hawaiian” about it that I appreciate every time I return. But the gates areas are not great…not great at all. 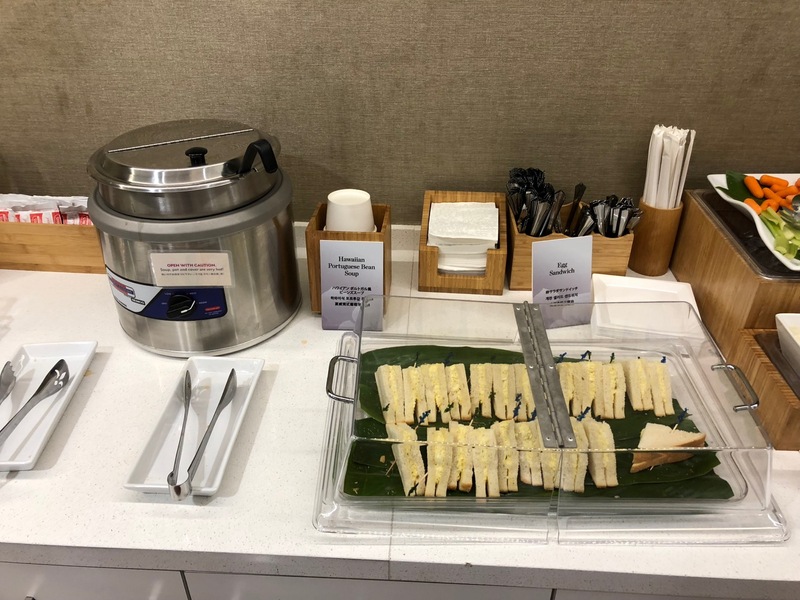 Thus, I was happy to have access to the Hawaiian Airlines Plumeria Lounge prior to my flight. Although a bit of a hike to get to, I was able to stock up on a couple of treats….that alone made it worthwhile. The Plumeria Lounge is reserved for Hawaiian’s longhaul premium class passengers. Thus, it is a step above the Premier Clubs also available at HNL, with real food and alcoholic beverages. I was not flying longhaul premium class on Hawaiian, but a Priority Pass card grants access. It was around 7:30 PM and the lounge was not crowded at all. The entire lounge was one big room with seating and a food/drink area in the rear right corner. Food selection included sandwiches, soup, crudites, and several packaged snacks. Let’s just say I stocked up on pineapple-shaped cookies from the Hawaiian Cookie Company…The drink selection included soft drinks, wine, coffee, and of course guava juice. There are also restrooms in the rear of the lounge, though no showers. Wireless internet was not fast, but fast enough to get the job done. One warning. If you are departing to the Mainland, you’ll have to go through an agriculture check before returning. Thus, just be careful about what is in your carry-on bags to avoid any potential fines. I like this lounge and would return. For Priority Pass members it represents a decent lounge option at HNL. While I think both Delta and United offer better lounges, the cookies alone will bring me back to this lounge. The lounge is open from 9:00 AM to 6:00 PM on Mondays, Wednesday, Fridays, and Saturdays. On Tuesdays, Thursdays, and Sundays the lounge is open until 9:30 PM. What!?! No “Spam” Sandwiches? Aloha. I would say “just okay” – very limited food – there were spam croissants which I was not game to try. Became full to overcrowded by about 11:30am when I was there, so I departed, and went next door to the wiki wiki shuttle area (because it was right there) to get the shuttle to my gates. Waited 15 min with no sign of anything happening, so got up and walked to my gate – about 10 minute walk!! !